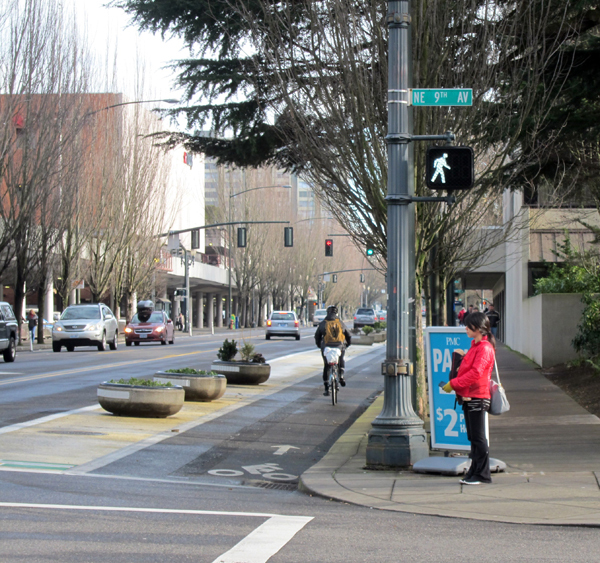 Cheap and flexible: A pilot protected lane project on Multnomah Street in Portland. From Calgary to Seattle to Memphis in 2014, the one-year pilot project is becoming the protected bike lane trend of the year. Street designers looking to use the design have been putting down their digital renderings and picking up plastic posts and barrels of paint, city staffers from around the country said in interviews this week. “I think there’s been sort of this realization that we don’t have to be so theoretical in our work and we don’t have to be so tied to the process,” said Kyle Wagenschutz, pedestrian and bicycle coordinator for the City of Memphis. “By doing a pilot project you’re able to very quickly put a substantial change on the ground in your city.” The point isn’t to avoid public dialogue, Wagenschutz argues. Just the opposite. 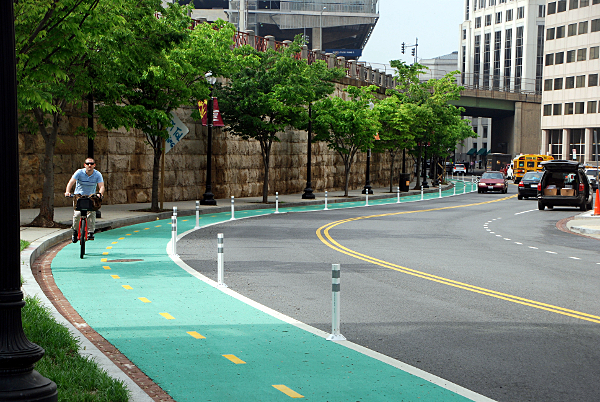 But that doesn’t prevent some pilot protected bike lane projects from misfiring. So we talked to a few creators of successful ones to get their advice. 1) Give it time to work. 15th Street NW in Washington DC started as a one-way lane with yellow posts; based on this trial, the city switched it to a two-way with white posts. Any pilot project of less than a year is unlikely to accurately capture how a project is working, said Mike Goodno, bicycle coordinator for the District of Columbia. 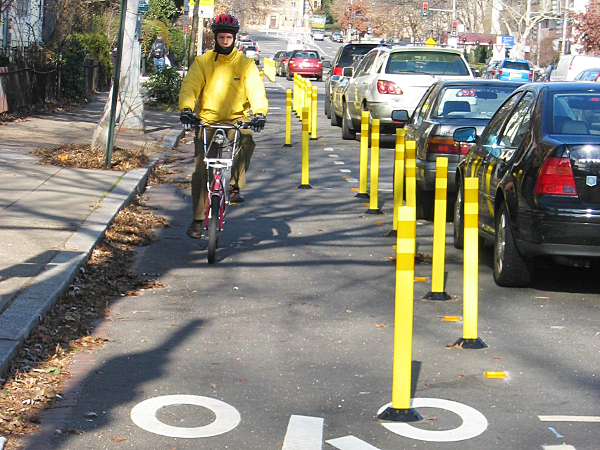 “It takes a month, I find, at least, just for people to get used to these changes,” said Goodno, whose protected lane pilot projects on 15th Street and Pennsylvania Avenue in Washington DC were two of the country’s first modern designs outside New York City. Public feedback and technical observations led the city to make major changes to both projects after they opened: moving Pennsylvania’s lanes to the center median and converting 15th from a one-direction to a two-direction protected lane. After those changes were made, both projects drove large and continuing increases in ridership. Portland project manager Ross Swanson agreed that pilots should last at least a year. A two-year pilot protected lane on Multnomah Street gave the city the chance to test the design during what turned out to be snowiest winter in years. “If there was a general minimum, you’ve got to test all four seasons,” Swanson said. 1st Street NE in DC. “As we’ve been evaluating these, we’re getting a lot better products,” says Mike Goodno of DDOT. Photo: BeyondDC. Another rule for successful pilots: choose several metrics that capture the goals project and be public about the results. “Nothing should be viewed based on one goal,” Swanson said. “Otherwise you’ve got a myopic project and you’re going to be caught blind on some other aspect you weren’t looking at.” On Swanson’s Multnomah project, where two out of four general travel lanes were converted into protected bike lanes, the numbers came out fine. Bike traffic rose, auto speeds fell, intersections kept flowing. But it wasn’t just a transportation project. The city also wanted to make the street more viable for nearby commercial development. A year after the project launched, an adjacent real-estate developer released its design for a $250 million mixed-use project, one of the most bike-oriented developments in North America, and the city’s largest mall said it was weighing a remodel that would open a new entrance facing Multnomah’s sidewalk. But when the numbers are less visible, gathering them costs money. In Washington DC, Goodno’s team spent several years squeezing evaluations of new bike projects into their free staff time before finally finding funding $192,000 for a third-party evaluation that gathered detailed performance measures, including public opinion. Here’s the scope of work they used, with a list of what was measured. Pilot project managers said that though people will always ask for specific numerical goals, it’s better to avoid drawing a hard line between success and failure and simply set out to measure the direction and magnitude of change. “If you set your timeline too short but your numbers are right, you may get them but you may be a year off,” Swanson said. 3) Be serious about outreach. Washington neighborhood commissioners Tim Clark (in orange) and Sylvia Pinkney (in blue) discuss a bike lane project on R Street. Photo: Nolan Treadway. People unused to pilot projects — both inside and outside city government — sometimes assume that they’re just a cynical tool for circumventing opposition. It’s true that pilot project fans are trying to make action, rather than analysis, the norm in city government. But they say good pilot project managers approach the public with an open ear — and enough of a budget to react to what they learn. “What’s really important with the pilots is that you have subsequent public involvement meetings,” Wagenshutz said. Before any pilot project begins in DC, Goodno’s team prepares an “operational changes matrix” which goes to relevant city staff, making it easy for public officials to accurately describe a project and its goals. Here’s one example; here’s another. Another tip from Goodno: when a project goes in, always “be ready with a few modifications” that can assuage the first-month worries from people troubled by small details of the design.